To make the champ, put the potatoes in a pan. Cover with cold water and add a pinch of salt. Bring to the boil, then reduce the heat and simmer for 15 to 20 minutes, until completely tender when pierced with the tip of a sharp knife. Meanwhile, heat the cream in a small pan with the spring onions for 5 minutes, until the spring onions have softened. Drain the potatoes in a colander and peel while they are still hot. Push through a potato ricer or sieve using a spatula. Beat the butter into the warm mashed potatoes, then mix in the cream and spring onions. Season to taste with salt and white pepper. To prepare the carrots, place them in a pan with the butter, stock, honey, ginger and some salt and pepper. Bring to a boil, then reduce the heat and simmer without a lid for 15 to 18 minutes, until tender. Set aside in the cooking liquid. At the last minute, heat a non-stick pan over a medium heat. Add the oil and place the seabass fillets in the pan, skin side down. Season with salt and pepper and cook for 2 to 3 minutes. Turn the fillets over and add the butter to the pan. Cook for a further 2 to 3 minutes, until the fish is cooked through. Remove the pan from the heat and serve the fish immediately with the carrots and champ mash. 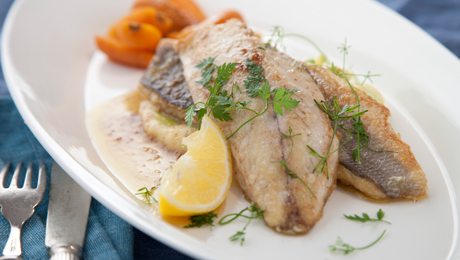 Drizzle with the flavoured butter from the fish pan, garnish with fresh parsley and serve with a lemon wedge.